Happy December 1st bookworms! Going green with my type today getting in the mood for the holiday- wreaths, Christmas trees and red & green packages under your tree! 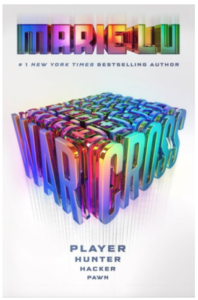 Since we will be wrapping up the year soon I decided to share a little bit about Warcross by Marie Lu. This has been my favorite fiction book I have read thus far this year. Firstly, I preordered this book based on the cover alone – it’s gorgeous! Luckily for me, this book is way more than a pretty cover. I was blown away – it was brilliant. I loved everything about it. Emika Chen is a phenomenal female protagonist – smart, strong, independent – everything we should aspire to be. The gaming elements and competitive feel of this book kept it rolling along nicely with plenty of action. The final two chapters – amazing – they say so much about our times, real life issues and philosophical ideas that could be hotly debated. I cannot wait for the next book to be released – I know for sure I will be preordering it! What has been your favorite book thus far this year?